Lakedale Resort features a variety of accommodation options, including a 10-room hotel, real log cabins, canvas cabins for a fabulous glamping experience, and camping. Lakedale Resort near Roche Harbor and Friday Harbor is also a great destination for workshops, meetings and retreats, providing you with an inspirational setting to have fun and achieve your goals! Your group will enjoy the many activities that Lakedale has to offer including swimming, fishing, and canoeing on one of our three lakes. Or imagine taking over the lodge for your wedding and having your ceremony on a point in the midst of Neva Lake! 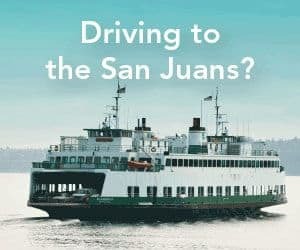 A San Juan Island vacation offers many more adventures including whale watching, sea kayaking, salt-water fishing, bicycling, wine tasting and local artisan tours. 30% off your 3-night camping stay in April – hooray!